The Tomb of Tutankhamun (1334 BC -1325 BC) is located in the Valley of the Kings on the West Bank of Thebes (modern day Luxor) and has the reference of KV62. The site of the burial place is cut into the floor of the valley. An entrance stairway of 16 steps descends into the tomb of King Tut. The tomb of Ramses VI, ref. KV9, was subsequently built directly above the Tomb of Tutankhamun. 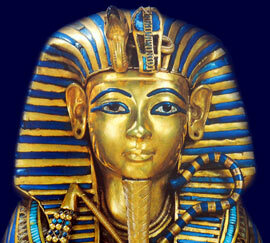 The tomb of King Tut consists of a series of corridors leading to a series of four different chambers.